Indulged in an iconic legacy, the design poses for retaining the magic of vintage dwelled in the designer’s edge incorporating intricate facets. Located at the prime location of Connaught Place,’ Kwality’ aims to create an inviting aura , serving a classic appeal of elegance. Indulged in an iconic legacy, the design poses for retaining the magic of vintage dwelled in the designer’s edge incorporating intricate facets. The composition is concocted in a manner such that it is relatable yet nostalgic to a divergent user group. “The concept was to showcase the inherent traditional appeal with a touch of Victorian era where the ambience could elucidate its charmof bygone days. The vintage theme, as was required to be portrayed, was imparted via the muted shades and antique assets, sprinkled around the entire décor or setup,” shared Abhigyan Neogi, by pointing that the ideology that aided in creation of such a unique design, was to explicitly preserve the historical vibe of the arena and yet allow customers to delve into in-genuine ideas of design. The client’s brief revolved around the core dogma of re-inventing the entire layout of the restaurant to an extent that it is presented with a fresh vibe while retaining the regal charm that Kwality withholds. This emerged as a challenge to the designers, to compose an environ that would be at par with the eminent name of the restaurant, amalgamating innate perspectives of contemporary design. The team brewed together elements of the golden epochs, merging it with the finesses of classical aspects and finally garnishing it with innovative royalty. From the design of the external façade itself, users are given a defining debut with teal and maroon awnings supplemented with glistening frames of glass. 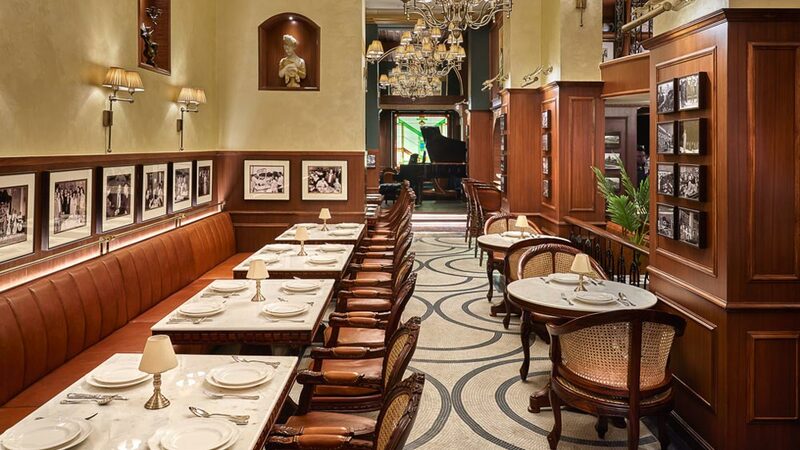 On embarking into the interiors, the domain on the right, which is decked up in wooden veneer paneling and a Sabyasachi wallpaper-- is what first catches a prolonged glimpse. Placed at a step higher than the level of the commuting corridor, the functionality of the space is accentuated owing to the subtle change of level. Additional magnificence has been scattered on to the space with tan shaded seating and a contrasting checkered flooring. The diminutive facets of wall décor here that include images in defining black frames, delicately inspire the vintage aura of the interiors. Further on, a baroque grill patterned staircase leads the journey to the intimate mezzanine dining. Flushed with an ornate gypsum celling and a classic chandelier, this precinct has its innate sense of elegance tipped off with flamboyance. Subsequent to this arena, on the ground floor, the space on the left has been formulated into an exquisite alley with similar seating options and marble mosaic flooring. This relatively slender sector guides the way to a distinctly divergent region adorned with an antique piano and a contemporary mantle piece. Dipped in a shade of sea-green, the arena also houses luxurious booth seating with the intricacy of a beveled mirror in the milieu. Opulence with a requisite book shelf area is a fresh idea hot from the oven, that defines and complements the other facets of the conceived décor. The black and white checkered marble flooring along with other significant minute pieces, amplify the serenity of the theme and render this space with its indelibility. Novelty has been introduced into the space with a subtle taste through the inculcation of rustic facets including the piano and the magnanimous book shelf. Intrinsic detailing as is evident from the pattern of wallpaper, the awnings and the grill patterns is what splashes the entire composition with its awe-inspiring touch. Galvanizing the layout is the ambient lighting scheme and the choice of color palette that ranges from textured brown veneers to floral walls with a dash of sea green. Posing as a challenge, was the age of the structural members, which were unable to support the load of other membranes, and thus had to be strengthened with metal girders even for slight layout modifications. Kwality, thus, portrays minimalism that has been implemented as a concept to conserve heritage and legacy with a dollop of ingenuity. Along with being pioneers of classic dining, the restaurant now poses with dignity for its stunning design and redefined extravagance.